Parenting a teenager who is answering back can be difficult for most parents. Recently someone who is parenting a teenager came in sobbing because she had an altercation with her teenager to the extent that there was not only a shouting and screaming match at home but the teenager broke all boundaries and insisted on going for a party the same day with her friends! Parenting a teenager can be a challenge so what can a parent do in such a situation? Firstly such a serious situation does not arise suddenly. There were many little episodes that led to it – not only events but also how the parents reacted to every other situation. The day started with the teenager waking up late and getting dressed hurriedly to go to school and the father drove off. She got dressed and proclaimed that she would take a taxi to school. However he returned to take her and she muttered under her breath causing her mother to lose her cool. When she returned from school the teen continued to sulk and did not speak with her father. This caused both parents to feel annoyed and her mother told her off about her bad behaviour the second time that day. This was not the best parenting strategy to follow. The grand finale was when she began to get ready to go to the evening party at her friend’s house and her mother put her foot down and said she could not go. However, the teen rebelled got dressed when the mother decided to lock all doors to prevent her. It ended in a physical fight! In parenting our children if we escalate our emotions to such an extent we are teaching them that it is normal to allow your emotions to get out of hand. Yes, we are humans and it is normal to get angry, however it is also imperative that we recognize when our ego comes into play. Because when in a situation we allow our ego to dominate then whether it is our child or our spouse it becomes a tug of war of the egos and both parties lose. With our children we don’t want them nor us to suffer, which this mother did. Option 1: Maybe the father could have driven off and the teenager would have to miss school, she could be asked to reflect on how to improve for next time. The problem I see in parenting is that we are focusing so much on punishing that we do not give time for reflection and improvement. Could the mother have held her calm and allowed the daughter to go off to school and maybe feel the remorse of her actions. Option 2: Maybe you could ask your child in the evening – what would be the best way to prevent such a morning scene from happening again? How else could you have chosen to react? Option 3: When you imprisoned your teen in her home she felt instantly like she needed to break free. The action of locking the doors was an extreme measure in the wake of your ego showing up thus pushing her ego to show itself to the same extent. 1) When parenting a teenager it is important to stay calm. Yes the obvious. But if you actually follow it you can avoid further situations. 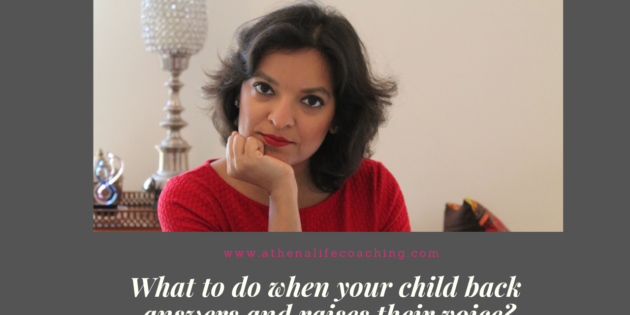 Your child will see you role modelling and understand that when he cannot manage his emotions he has shouted but you have stayed calm therefore you know how to manage your emotions. And in the future he will know how to react or respond without needing to resort to back answering. Your staying calm will also prevent other issues plus help you think more clearly and say the right thing. 2) What kind of role model are you? How do you speak to your spouse or neighbor or friend or children? Are you playing the role of an adult and managing your emotions? Or are you losing your control and showing your teenager that it is both normal and acceptable to do so? 3) Establish the boundaries when parenting a teenager. Explain to your teenager how you expect them to behave. How you expect them to speak with you. 4) Enforce consequences. What will happen if they do not get up on time. What will happen if they do not finish their homework and want to go to a party? What will happen if they answer back? They need to know what the consequences are of their behaviour. 5) Find out what is the root cause of your child answering back or shouting? Because your teenager could be suppressing their emotions. Maybe they feel unheard at home. Or they are feeling left out at school? Is something happening at school? Remember not to take your child’s behaviour personally. They have their own struggles and as parents you need to create a safe space for them to be able to express themselves. If you are struggling to understand your child or teenager and are feeling overwhelmed and confused and want me to help you make some sense of your situation contact me to learn more about how I can help you. Click HERE to fill up my call application form.